Happy Tuesday to you and welcome to our challenge this week at Stamp Ink Paper. It's a colour challenge for you this week. I immediately thought of Watermelons when I saw these colours, so I had a bit of fun and made some cute watermelon cards. I don't generally do cute but it gave me an opportunity to try something different. Come and have a look. This was the first one I made using a circular base of Basic Black card then folded it in half. It gave me an opportunity to drag out my Circle scissors which haven't seen the light of day in many years. I so rarely have the need to cut a larger circle or layered circles like this size and can generally get away with the use of my Circle collection framelits or smaller circle punches. The stamp I've used for Celebrate comes from the photopolymer set called Celebrate Today. I freestyle cut the banner shape and placed it onto black card cut with the Decorative Label punch. There are actually 2 of those back to back (Whisper white on the back) held together with dimentionals and a toothpick thru the middle which is adhered into the layers of the card. I've held the card to try and show it closer and show perspective as to the size. The layers of each coloured semi circle here has been sponged with ink and I cut some leaves off a flower stem framelit to create the seeds. While I was playing with these colours and had all these circles/semi circles cut out, I decided to make a second card with a smaller piece of watermelon on it. Someone took a bite out of it, lol. I've used the Stylish Stripes embossing folder on the background here and some Crushed Cucumber ribbon. The greeting comes from the Vintage stamp set Well Scripted and is punched out with the XL Oval punch. Here's a closeup of the melon. Here are both of my cards for the colour challenge for your inspiration. Thanks so much for stopping by today. 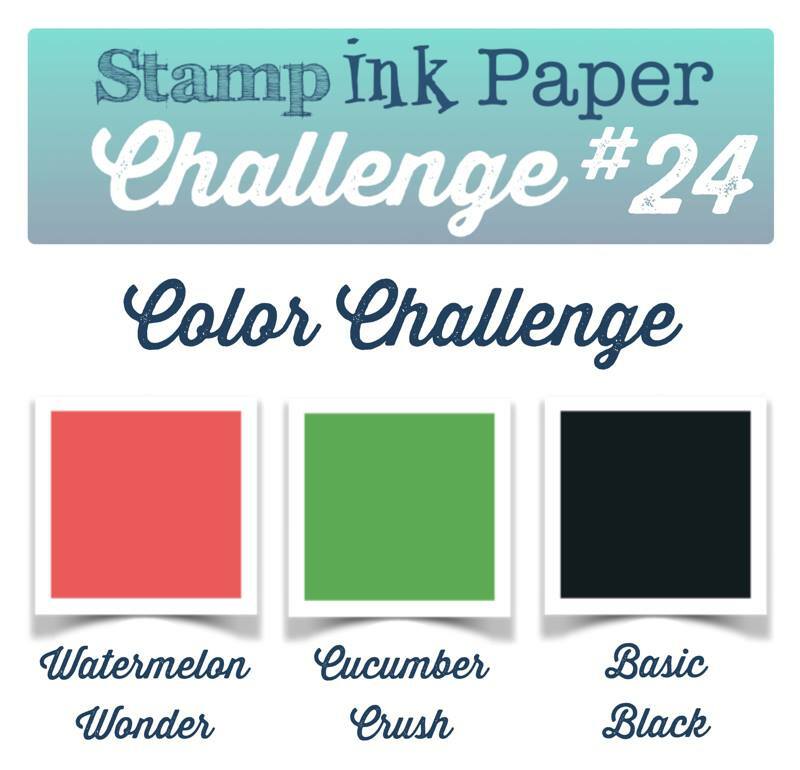 We are looking forward to your entry this week at the colour challenge at Stamp Ink Paper. Carolyn you are so clever! Your watermelon cards made absolutely perfect use of the colors, and I love the little seeds and the slice with a bite taken out.